The exact amount you will spend on college expenses will depend on your class schedule (textbooks needed, fees, etc.) and your housing and meal arrangements. Below is an estimate of the costs per semester, based on enrollment in 16 credit hours. **19 meal plan, double occupancy room averaged over fall and spring semesters (least expensive option). *Proposition 300, passed by Arizona voters in November 2006, stipulates that college students who are not legal United States citizens or are without lawful immigration status must pay out-of-state tuition. **Per credit hour, in addition to general tuition. How and When Do I Pay My Tuition and Fees? Tuition and fees should be paid to the Cashier in the Fiscal Control Office located in the Student Services Building on the Eastern Arizona College campus. Payment should be made at the time of registration. You may pay by phone, online or in person with your VISA, MasterCard, American Express, or Discover card. Note: Debit/Credit card payments will be assessed a 2.75% non-refundable fee by the card processor. Students can avoid paying debit/credit card fees by choosing the ACH (E-check) payment option available online through Gila Hank. You may also mail a check or money order to Cashier, Eastern Arizona College, Thatcher, AZ 85552-0769. Checks, drafts, and postal or express money orders should be made payable to Eastern Arizona College. Students may also choose to enroll in an online payment plan managed by Nelnet Business Solutions. Those choosing the payment plan option pay an enrollment fee of $25 and are then able to spread their tuition, dorm and meal plan expenses over several months. Payment plans are accessible through Gila Hank by going to the "Pay Tuition/Fees" tab and choosing the "Payment Plan" link. Payment plan options include ACH (E-check) and debit/credit card (card processing fees do apply). Registration is not complete until all tuition and fees and outstanding debts or balances are paid, or one is successfully enrolled in an online payment plan. If you expect to receive financial aid you need to work closely with the Financial Aid Office to seek and receive financial assistance. If you are seeking aid for the fall semester, you are advised to begin the application process early the previous spring. Classes will be automatically canceled if tuition and fees are not paid by the fourth Monday in July for fall semester and the second Friday in December for spring semester. The Academic Calendar sections of the class schedule and catalog specify the dates by which all fees or financial aid arrangements are due. If payment is not received by these dates, your registration will be canceled. If your registration is canceled, you may not be able to get back into all your classes. Don't let this happen to you! Be sure all financial arrangements are made by the date due. This agreement is made by and between the New Mexico Commission on Higher Education, an “agency” of the State of New Mexico and Eastern Arizona College (and other community colleges in Arizona). The purpose of the agreement is to establish a tuition reciprocity program to enable selected students from New Mexico to enroll at designated institutions of higher education in the State of Arizona with authorization to pay Arizona resident undergraduate tuition rates, and to enable an equal number of selected students from the State of Arizona to enroll at Western New Mexico University in New Mexico with authorization to pay New Mexico resident undergraduate tuition rates. Be a legal resident of participating states–Alaska, California, Colorado, Hawaii, Idaho, Montana, Nevada, New Mexico, North Dakota, Oregon, South Dakota, Utah, Washington, or Wyoming. Texas residents, while not officially included in the WICHE consortium, are also invited to attend Eastern Arizona College as WUE eligible. Be admitted to Eastern Arizona College. Maintain full-time student status while on the waiver having an annual accumulation of 24 credit hours at a minimum 2.0 GPA. 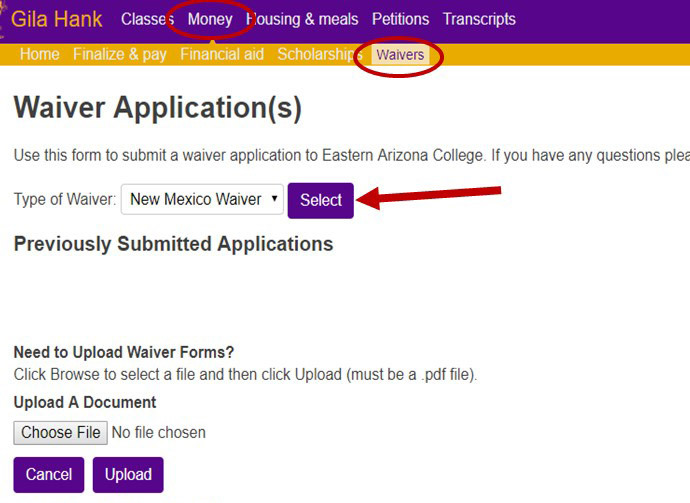 When you apply for admission to Eastern Arizona College–print out a WUE waiver application or request that an application form be mailed to you. What is EAC’s Refund Policy? Tuition and Fees: Refundable tuition and fees are defined as general tuition and out-of-state tuition. All students who officially withdraw from the College or individual semester-length or short-term courses before the close of registration for the course will receive a full refund. Students who withdraw from open entry/open exit courses after the term or semester in which the course is offered has begun will not receive a refund. Fees including class, lab and other special or miscellaneous fees are not refundable. All refunds and deposits that may be due a student will first be applied to debts that the student owes the College. When federal student aid is used to pay for tuition and fees, the refund will be made to the federal fund, not to the student. Federal regulations require that if you are a federal financial aid recipient and you totally withdraw from the College on or before the 60% point in the enrollment period, you must return a percentage of the federal aid funds disbursed. For example: if you withdraw at the 30% point of the enrollment period, you earn 30% of all aid that could be disbursed. The remaining 70% of the aid is unearned aid and must be returned. Further information is available at the Financial Aid Office and/or their web page at www.eac.edu/finaid or in the disclosures section of this catalog. Cancelled Courses: When the College cancels a course, a full refund will be made for the cancelled course. Other Refunds: If you wish to appeal the refund policy you may do so by petitioning the Admissions and Academic Standards Appeals Committee. Petitions are submitted online to the Records and Registration Office. A student in the Armed Forces or the Arizona National Guard who is called to active duty and assigned to a duty station, verifiable by a copy of the orders, will be allowed to withdraw and receive a full refund of tuition provided courses have not been completed. Residence Halls: In order to meet the demand for housing and provide rooms for those students who really need them, there are firm cancellation and refund policies in effect. If you wish to cancel your residence hall reservation, you must notify the Housing Office at (928) 428-8605. Cancellations on or before July 15 for the fall semester or on or before December 15 for spring semester will result in a full refund of your $150 housing reservation/damage deposit. Cancellations after these dates will result in the loss of your housing reservation/damage deposit. You must pay your room cost prior to the first day the residence halls open for the semester. If you do not pay by this date, your reservation will be cancelled and your housing reservation/damage deposit forfeited. If you pay then cancel your reservation by this date, you will be eligible for a full refund of your room cost. If you move out of the residence hall prior to the end of the academic registration period, your housing reservation/damage deposit will be forfeited and you will be eligible for a 50% refund of your room cost. After the end of the registration period, there will be no further refunds of room costs. Housing reservation/damage deposits will be refunded minus individual and/or communal damages. Petitions for a waiver of the refund policy may be filed in the Student Life Office. Meal Plan: Students who cancel their meal plan through 60% of the campus food service period will be eligible for a pro-rata refund only if they completely withdraw from school. Students living in the residence halls are required to have an approved meal plan.